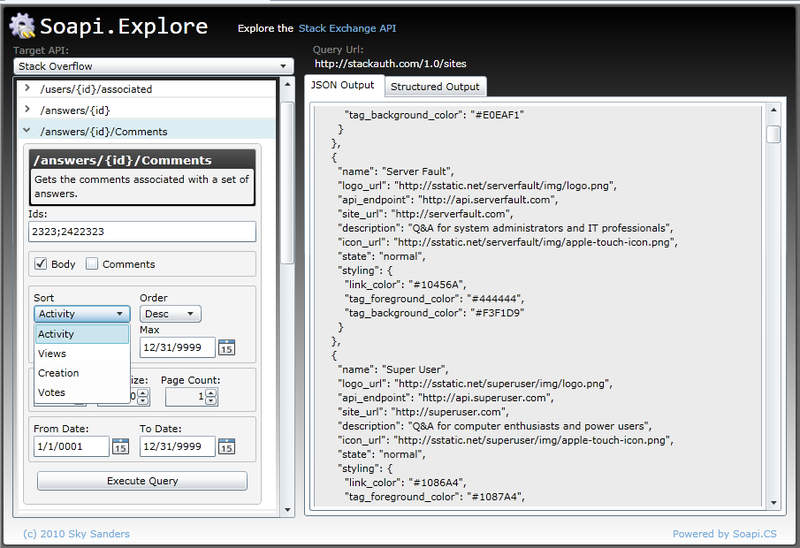 Soapi.Explore SL is a Silverlight based annotated test harness for the Stack Exchange API. All API methods and parameters are fully supported. Sites are updated automatically - you may query any site in the Stack Exchange network. All parameters are documented in tooltips and are validated. Multi-Page results are fully supported. coming soon structured data output that is sortable, filterable and exportable. 1 In order to deal with large datasets, a custom virtualized listbox is used to display the JSON. You may not select text to copy but may press ctrl+c to copy the entire result to the clipboard. Silverlight, when accessing the API, does not have the ability to detect error details. All API errors will be reported in the JSON output as 'Not Found'. Soapi.Explore SL is free to use and is licensed under GPL V2. Soapi.Explore SL was created by code poet. Soapi.Explore SL was written in C# 3.0 using Visual Studio 2008 and Expression Blend as a sample reference implementation for the Soapi.CS client library. Full source code for Soapi.Explore SL is found in the samples folder of the Soapi.CS source code. The difference is that the JS version is a sanity check tool that reflects the current state of the API, whatever that may be, and this Silverlight application is finely tuned to the API version 1.0 as published. As an example of how leveraging Soapi.CS and the reusable controls in Soapi.Contrib.Silverlight can increase productivity when writing code against the API, I include the source code for the Soapi.Explore Silverlight application. // this is a total hack. need to use mvvm light and a command pattern. "Large result sets may be hard for your browser to handle.\r\nAre you sure you want to continue?" +"\r\n\r\nNote: I am working on a virtualized textbox\r\nthat will relieve this issue." Not the answer you're looking for? Browse other questions tagged app obsolete soapi.cs dev-tool silverlight .